Protective styling is a great way to grow your natural hair and reduce chances of breakage from daily manipulation. 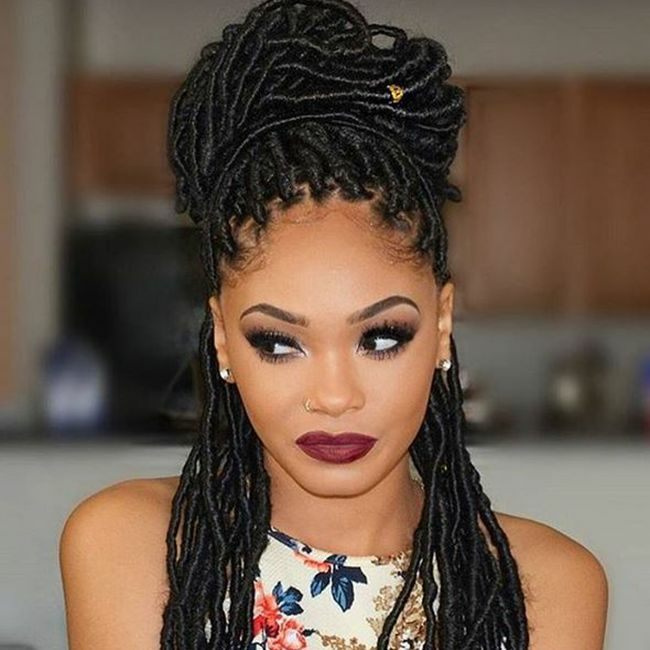 When removing styles such as braids, twists or most extensions, there can be a lot of breakage. When the hair has been up for a period of time, there can be clumps of buildup and even matting. Here are my tips to minimize causing unnecessary hair loss on your post protective style wash day. After removing your braids, sew-in or any type of long term style, always use a detangling pre-conditioning treatment. This is a key step to avoid excessive hair loss. Here are some simple options. This is a very simple recipe. Takes minutes to do and only requires 2 ingridents-- flaxseeds and water. Need to know how to make it? Add the seeds to the water. Then turn the stove on to a medium setting. Let it boil and stir constantly. Allow it to thicken. When you notice white frothiness that resembles egg whites it's done. Strain the gel from the seeds. Let it cool completely without closing the container. Pour the gel into a dye applicator bottle for easy use. Only pour the amount that will be used for the current detangling session. *For future use: I pour the remaining flaxseed gel into ice cube trays. The night before I plan to wash my hair, I put a few cubes in a bowl to thaw. It is melted, room temp and ready to use by morning. Pour your gel into a dye applicator bottle and apply it directly to the hair. Rub it in with a smoothing motion. It has tons of slip making it easy to remove any build up, tangles and shed hairs. Blend 1 cup of any inexpensive yet very slippery conditioner of your choice with 2 tablespoons of olive oil. Apply the mix very liberally. Work it through each section individually. Be sure to remove any matting, build up and loose hairs with your fingers. Use a very wide tooth comb to more thoroughly detangle the hair. Always start from the ends and work your way up to the root. Rinse the prepoo from your hair and shampoo as normal. Now it's time to deep condition. Always show your hair some extra love when deep conditioning after any protective style. It doesn't need to be an all day process. Check out my fav moisturizing diy deep conditioning recipe below. It can be done in 30 mins or less. *Use a very emollient butter such as avocado, mango, shea or soy. They have wonderful conditioning properties. **Adjust the amounts used according to the length and density of your hair. 1. Blend the ingredients together until well incorporated. 2. Apply to the hair, cover with a disposable cap and wrap with hair turban. 3. Leave the mask in for 15-30 mins. 4. Rinse out very well with cool water. 5. The mask ingredients with ingredients that will leave your hair feeling soft, smooth and revitalized. *Tip: If any of the mask is left over it can be stored in the freezer for use on your next wash day. It will spoil in the refrigerator. Give these tips a try and share your results! This article was written by by Emilia Obiekea of Adorebotanicals.com and published on CurlyNikki.